Today, we’re going to have a look at the latest Max Keyboard, the Blackbird TKL, with brown switches, blue backlights and a UK layout. The Blackbird has a feature list as long as your arm – media controls, individual key backlighting, side backlighting, NKRO, on-board memory, built-in timers, USB ports, cable management… and yet the layout of the keyboard is a standard Tenkeyless, plus a single Function key. That’s a rare combination, and it could be quite a strong one. I’m excited to take a closer look at this keyboard, so let’s get started! The Blackbird is a handsome but understated keyboard, with a black chassis and a fairly conservative design. There are a pair of extrusions at the top of the keyboard and an angled edge for your wrists; apart from these minor flourishes the word that comes to mind is ‘boxy’. The keyboard doesn’t include a numberpad, making it around 75% the width of a full-size keyboard. You’ll think the Blackbird heavy if you’re a newcomer to mechanical keyboards, but it feels similar to other plate-mounted mechanicals. 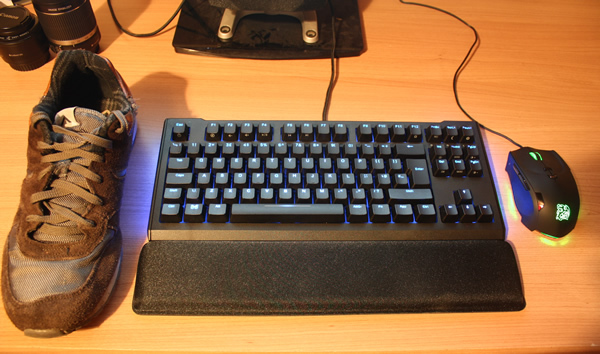 As I mentioned in the introduction, the Blackbird features a standard TKL layout, like that of the Filco Majestouch-2 Tenkeyless, with one substitution: A Fn (function) key on the right hand side, replacing the right hand Windows key. I really like the choice to put this Function key on the right hand side, as it leaves the more commonly used left hand side entirely standard and allows additional functions to be added to the right-most key clusters. We have a timer function on Escape, media controls on F1-F6 and backlighting controls on the Insert/Delete cluster. The Blackbird has an interesting almost stencil-style typeface, sitting in somewhere between the blocky gamer script you’d get on a Razer and the more professional and legible Futura of a Filco. Each letter is placed in the upper-centre of the key, with secondary functions (e.g. media and backlight controls) placed on the front of the keycap. The Windows key has a Max logo (which is a debatable improvement), but otherwise things are fairly standard in terms of symbols. The Blackbird has double-shot injection-moulded ABS keys, with white/transparent legends that allow the blue backlights to shine through. The advantage of double-shot keycaps is that the legend will never wear away, keeping the keyboard looking good for decades. Given the fact that we’re dealing with Cherry switches and an entirely standard layout (with 1.25x size modifiers throughout), getting replacement keycap sets for this keyboard should be quite easy. 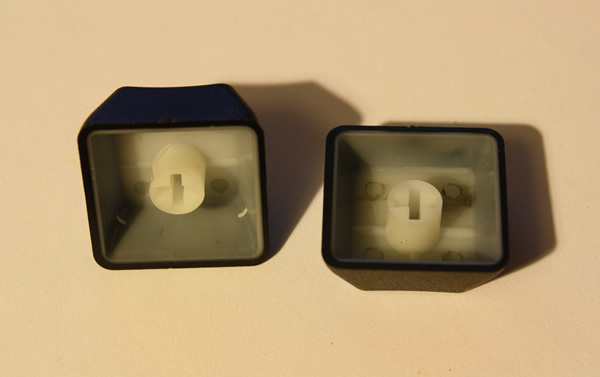 Max themselves also produce a set of semi-transparent keycaps, which we’ll be having a look at in an upcoming article. Let’s talk lights. First, we’ve got three status LEDs in the upper right of the board, between the Print Screen and Insert clusters; these are Gaming Mode (Windows key disabled, signified by a G), Caps Lock (signified by an A) and Scroll Lock (signified by a downwards facing arrow). It’s nice to have that standard three light arrangement, with the gaming mode light taking the place of number lock. 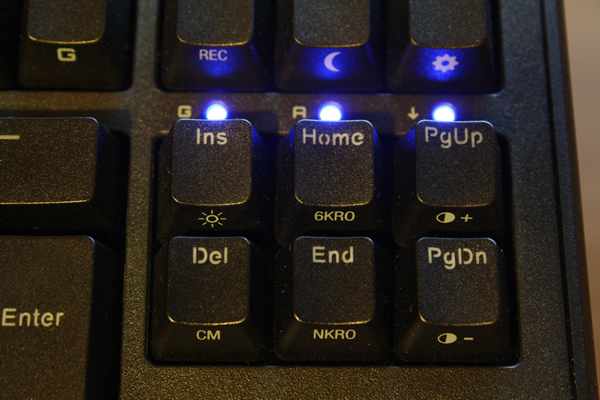 We also have blue backlights behind each key. There are four levels of brightness (low, medium, high, pulse) and of course the backlight can also just be turned off. These can be triggered on and off individually, or en-masse. Out of the box, you’ll get an alternating column arrangement that looks pretty cool, but it’s also possible to light just the keys you need during a certain game (e.g. WASD / QWER), or just the letters, or indeed any other combination that you like. 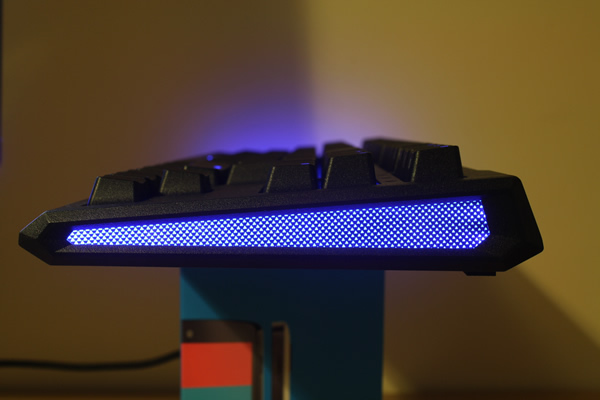 There are also lights that shine through the transparent sides of the keyboard in a subtle diamond pattern. You won’t see these directly while using the keyboard, but they do look pretty cool. Like the key backlighting, these side lights can also be disabled if desired using Fn + Pause. 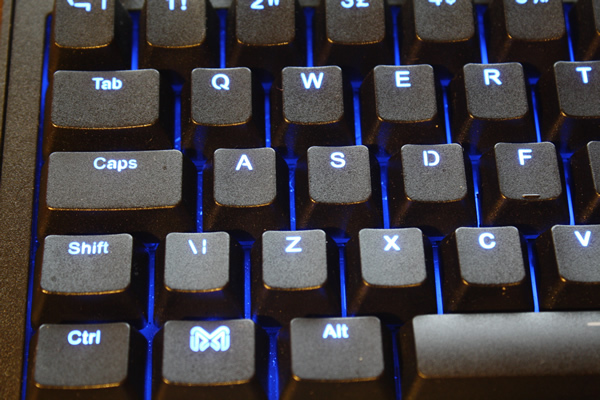 Using the keyboard’s built-in memory, these backlight settings will be remembered even if the keyboard is unplugged or changed to a different PC. 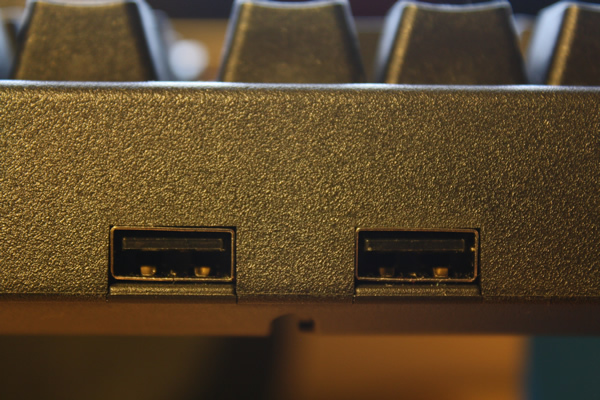 Let’s move onto the far side of the keyboard, where we have a pair of USB ports. These provide 100 mA of power (enough to power most mice, keyboards, gamepads and flash drives but not enough to charge a phone). It’s handy for use with a right-handed mouse, and reduces the amount of cables needed to be slung into your PC. Now we’ll look at the bottom of the keyboard, which contains a number of familiar elements. 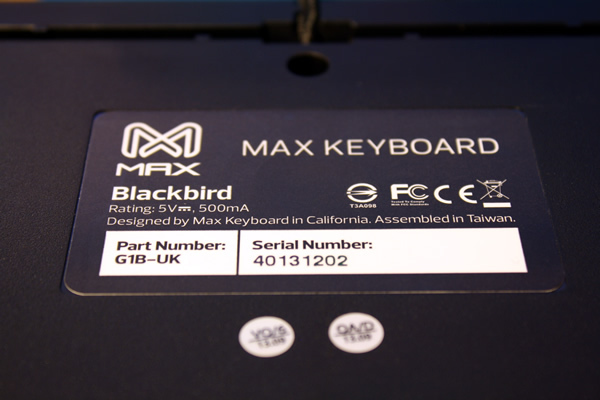 We’ve got the standard sticker (concealing a screw necessary to take apart the keyboard, no doubt) with the Blackbird name and a standard “designed in California, made in Taiwan” notice. There’s also a set of four generously sized rubber grips to anchor the keyboard to your desk, plus a pair of plastic feet that snap into place with a satisfying click. Finally, we’ve got the USB cable. This is non-detachable (a good thing considering the higher failure rate of detachable cables) and there are three channels (left, centre, right) for cable routing. I think that just about covers the physical features, so let’s move onto my impressions of the keyboard after about a week’s worth of use. So, first things first – writing! I wrote the entirety of this review and quite a few other articles on the Blackbird, and I’m quite fond of it. The combination of matte double-shot keycaps and plate-mounted brown switches really suits me, and typing on the keyboard is an absolute joy. The tactile feedback and the deep ‘thock’ of the keys as I speed across them is incredibly satisfying, and a bit quieter than the average keyboard with blue switches. I’m not such a big fan of the plastic Cherry-style stabilisers (compared to the metal Costar stabilisers on Filco keyboards), but the difference isn’t enough to detract from the overall experience. Backlighting isn’t a must-have for me when writing, but it’s always nice to have. I’ve been touch-typing since I was 10 but I still can get jumbled at night when I’m looking for odd symbols like “|” or “~”, so having the option of backlighting when needed is appreciated. The individual backlighting let me light just those hard-to-find symbols, which was a nice touch as well. The layout of the keyboard is top notch, in that it’s entirely standard with the exception of that added Function key on the right hand side. That lets me write quickly and accurately, without the juggling and re-learning that’s usually necessary for feature-heavy / gaming-focused keyboards, particularly 60 or 75% size models. Max have done well to provide these extra features without adversely affecting the typing experience with a sub-par layout. So from a writing point of view then, there’s little more I could ask for from a mechanical keyboard. I’d say gaming is the biggest reason to get a mechanical keyboard these days, and you’re going to be well equipped with the Blackbird. Cherry MX Brown plate-mounted mechanical switches are among the most desirable in the world, thanks to their light tactile feel, so you’re starting from a very good position. The added gaming features sweeten the deal further for those that make use of them, and don’t get in the way of those that don’t. I particularly liked the individual key backlighting, particularly when I was learning a new game. I lit up only the keys that I needed to use, so whenever I looked down there were only a few options that I needed to examine instead of the entire board. * Full backlighting is probably more useful for games that you’ve already memorised, but it’s nice to have the option to do both. *I’d love to see that done automatically in future, where there’s software that lights up only the keys that are used whenever you launch into a game. You could go further too, and change the key backlighting based on menus or options in the game, e.g. when playing a strategy game like StarCraft you could light up keys that correspond to unit groups you’ve saved or abilities that your currently selected unit can perform. The added features of the Blackbird really sing during everyday desktop use. The media controls are incredibly convenient (if supported by your software of choice), and if you don’t have a physical knob for your speakers then you’ll appreciate the built-in volume controls as well. 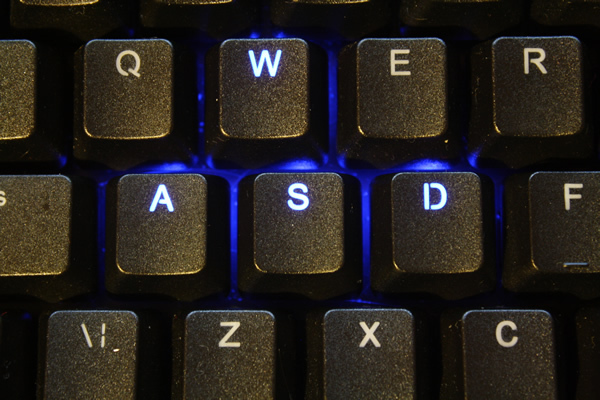 Gaming mode – disabling the Windows key to prevent accidental alt-tabs – is not something I tend to use myself, but it seems a commonly requested feature and it seems well implemented on the Blackbird. Other features are more hit-and-miss, like the timer – I’m not sure why I’d need such a function on my keyboard if I have a watch, smartphone or a PC at my disposal. Still, its inclusion doesn’t cost me anything, so I can’t really count that as a negative. Overall, the keyboard is one of the best I’ve used just for general PC use, and the only real features you might miss are spare keys for macros and the numberpad… and you wouldn’t choose a TKL keyboard in the first place if you wanted either of the two. Surprisingly, the Blackbird is quite OK for mobile use. While it’s bigger and heavier than the average 60% size mechanical like the Filco MiniLa or Matias Laptop Pro (and dramatically bigger and heavier than the average Bluetooth keyboard), you do get the full perfect typing experience of a mechanical keyboard and the keyboard is small enough to fit in most bags without problem. The Blackbird lacks Bluetooth, but can still be connected via USB. For most smartphones and tablets this requires an adapter of some kind; for my Nexus 5 smartphone and Nexus 10 tablet I used a USB OTG microUSB to USB adapter. One potential issue is drawing too much power, so you’ll want to disable the key and side backlighting for mobile use. I wouldn’t suggest using the Blackbird as a mobile keyboard for any but the most dedicated mechanical keyboard enthusiasts, but it is an option if the circumstances are right. The Max Keyboard Blackbird is a much stronger keyboard than I was expecting, with an excellent level of baseline quality and almost every feature you could ask for. If you’re looking for a TKL keyboard, this should be near the top of your list. Popular gaming features included, like individual backlighting, Windows key disabling, etc. that is not a 75% keyboard. use the correct terms. 3 Pings/Trackbacks for "Max Keyboard Blackbird TKL"